The name "Southeast Building" reflects the continuing scholarly uncertainty as to the building's function and use. The traditional suggestions, that the Southeast Building was a tabularium (public archives), or library, or both, are unlikely but cannot be refuted, since no canonical architectural form for the library or records office can be identified for the Augustan period, and because the epigraphical evidence for the Southeast Building is inconclusive. It is best to regard the Southeast Building as performing an all-purpose administrative function. Before the construction of the Southeast Building, there was no large structure on the site. There is evidence of a road passing over the site from NW to SE over the western part of the site, and there are remains of house paving floors from the 4th century. On the eastern part of the site there are surviving walls of houses from the Hellenistic period on either side of a slightly curving N-S road. Two separate buildings were constructed on the site in the early years of the Roman colony. Both buildings had a colonnade of 14 columns aligned at right angles to the South Stoa and the Central Shops, which enclosed the eastern side of the upper forum as a well-defined rectangular space. To the east of this colonnade, the first and second buildings differed considerably. The first building had a symmetrical bipartite plan arranged on either side of a central E-W corridor. On each side were three rooms: a large room opening onto the central corridor leading to a smaller room of the same width; and a long rectangular N-S room to the E of these two rooms. This reconstruction is based on Weinberg. Weinberg's reconstruction has since been challenged by Williams, who restores only one narrow rectangular room on either side of the central E-W corridor. 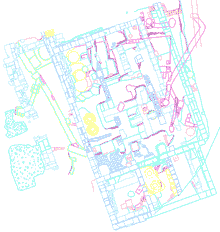 The second building was shorter (from N-S) and fatter (from E-W) and consisted of a large hall, with a small rectangular room to the south. The large room was divided into three aisles by two row of five internal piers (two of which were engaged with the N and S walls). The smaller room was originally one open space, which was divided into three smaller rooms at a later period by two internal walls. Figure 2: Actual State of the Southeast Building. The first building was constructed of reused Greek poros blocks, which dates the building to the early years of the Roman colony. The first building was destroyed and the second building built with a slightly different groundplan to allow for the construction of the Julian Basilica to the north. These two buildings may be given a flexible late Augustan or Tiberian date. The Southeast Building continued in use until Late Antiquity with only minor changes. Building summary written by Alexander Thein. Makowiecka, E. The Origin and Evolution of Architectural Form of Roman Library. Warsaw: Wydawnictwa Uniwersytetu Warszawskiego, 1978. Purcell, N. "Atrium Libertatis." Papers of the British School in Rome 61 (1993) 125-155. Romano, I. B. "A Hellenistic Deposit from Corinth. Evidence for interim period activity (146-44 B.C.)." Hesperia 63 (1994) 57-104. Strocka, V. M. "Römische Bibliotheken." Gymnasium 88 (1981) 298-329. Weinberg, S. S. The Southeast Building, The Twin Basilicas, The Mosaic House. Corinth I, v. Princeton: American School of Classical Studies at Athens, 1960. Williams, C. K. and P. Russell. "Corinth: Excavations of 1980." Hesperia 50 (1981) 1-44. Williams, C. K. and O. H. Zervos. "Excavations at Corinth, 1989: The Temenos of Temple E." Hesperia 59 (1990) 325-369. Wiseman, J. "Corinth and Rome I: 228 B.C.-A.D. 267." Aufstieg und Niedergang der römischen Welt II.7.1, (1979), pp. 438-548: 514. © 2007David Gilman Romano and the Corinth Computer Project.